The Community Garden’s February gathering featured Courtney Fraser from Eat Local Lee. This non-profit promotes the benefits of buying and eating fresh, locally-grown food. The organization also produces a map which helps residents and tourists alike find farmer’s markets, farm stands and other locations where locally-grown food is sold. You can pick up a copy of the map at the park. Just visit the little information building on the way to Parking Lot 3. 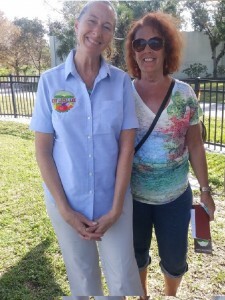 Our March gathering in the Community Garden featured Erica Shoenberger from the ECHO nursery and bookstore in North Fort Myers. She demonstrated how to make the best compost. 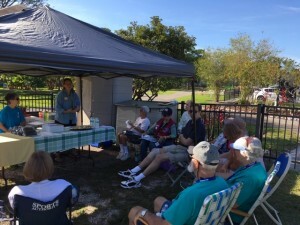 At this gathering, gardeners learned how to put their Community Garden beds “to sleep”. They received kits with the necessary tools and materials to do so (yes, it’s already getting to be that time – we can’t believe it, either!). 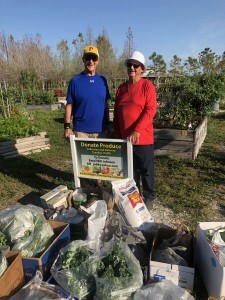 As of March 12th, the Community Garden has harvested and donated 1,400 pounds of food for the 2019 growing season. This is an incredible feat of generosity on the part of our gardeners and volunteers. The amount of produce available has expanded since recruiting the ABC bed in the Children’s Garden for this mission. All food harvested and collected is delivered to the Community Cooperative. Many thanks to Bill Johnson for his leadership service to the community. You are a hero, sir! 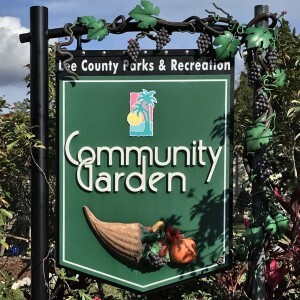 All Community Garden beds renew on October 1st. Invoicing begins August 1st. Current renters have the opportunity to renew by September 30th. If a bed is not renewed by September 30th, then it’s available for our garden bed “lottery” on October 1st. If you are interested in getting on the “lottery” mailing list, please click here for more information.